The lead nurturing phase of your email marketing campaign is a critical part of the sales process. Even though a prospect may not be in the position to buy just yet, you need to make the effort to stay in touch with them and keep your brand or company in mind. The most effective lead nurturing emails engage the prospect in a certain way — either by leading them to the next stage of the buying process or just reminding them about what they need or were interested in when visiting your website. Unless the recipient has agreed to receive a newsletter or similar updates, you want your lead nurturing emails to be very specific and focused on a singular topic — the product or service the prospect is in the market to buy or has shown interest in. Avoid dumping prospects into the same list as your newsletter subscribers or you may end up getting flagged as spam. You need to send these prospects highly targeted and relevant emails so that you are walking them through the sales process. If you’re selling a product or service that has garnered positive reviews from customers and clients, make sure to highlight that somewhere in a lead nurturing email. Email recipients who are still on the fence about making the purchase or signing a contract may be more convinced when they read someone else’s firsthand experience. Include a large block quote of a testimonial below the ‘buy’ or ‘add to cart’ button embedded within the email so that the prospect makes the decision to move forward. Casper does a good job with this when reminding customers they forgot something in their cart. Whether it’s a quick checklist of ideas related to the product or service the prospect was interested in or a video tutorial embedded within the email, consider more educational and less promotional messaging for some of your lead nurturing emails. Providing tips, pointers, and ideas about how to use a product or general tips that can improve the recipient’s life in some way are usually well-received. This might naturally lead them back to your website but the goal here is engagement — you just want the prospect to pay attention and remember you. Sephora does a great job with this approach by embedding a video tutorial about one of its latest looks within the email. It also provides plenty of CTAs for the recipient to start shopping. A lead nurturing program can only be effective when the emails encourage action and move the prospect through the sales process. You want to make sure emails are being sent at the right time as the lead makes their buying decisions and interacts with your company in some way. 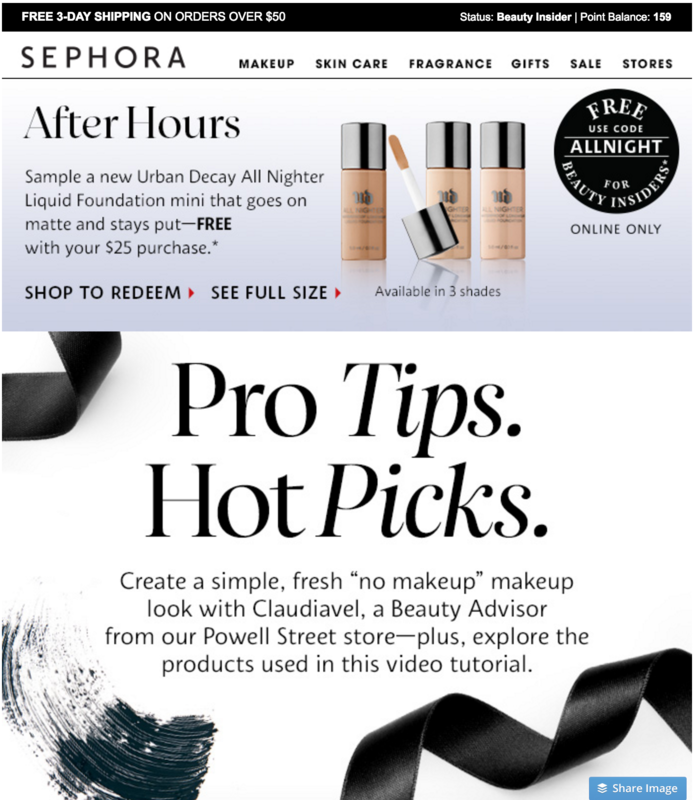 You might send out a trigger email when somebody abandons their cart, for example, or send a trigger email when someone has requested an item that is out of stock and is now waiting. The goal is to mirror the sales funnel that the lead would have gone through if they had stayed on the website and made the purchase. Your emails need to bring them back to that sales process so that you don’t lose the customer. Your lead nurturing emails are an important part of the sales process and need to be designed in a way that engages and encourages prospects to move forward with the purchase. Some emails can be more educational in nature while others may be a snapshot of a cart that is waiting at checkout. Either way, these need to be personalized emails focused on a singular topic so that you can re-engage the prospect at just the right time.